Metal is often implanted by orthopedic surgeons to fix broken bones, replace worn out joints, or correct deformities of the skeletal system. Most patients assume the metal is strong—even stronger than bone. However, metal can break, and something may need to be done about the broken metal. Here we discuss what can cause a broken metal implant and what needs to be done about it. Metal has tremendous strength. The strength of a metal depends on a number of factors including the type of metal (common metal types used in surgical procedures include stainless steel and titanium), how the metal was fabricated, and the size of the implant. Metal implants can break. Typically they break as a result of fatigue failure. This means that the metal is not broken as a result of one sudden load, but rather it finally succumbs to repetitive cycles of stress. Consider a paper clip. If you stress the metal of a paper clip, it can withstand a reasonably large force—it may bend, but usually won't break. However, if the paper clip is bent back and forth, a number of times, it will usually snap. Metal implants can fatigue in a similar way if subjected to repeated cycles of stress. Metal implants are typically made to support the skeletal system until the body can support normal stress without the aid of the implant. Bone has a great advantage, that your body can make new bone to better support the stresses normally encountered with activity. 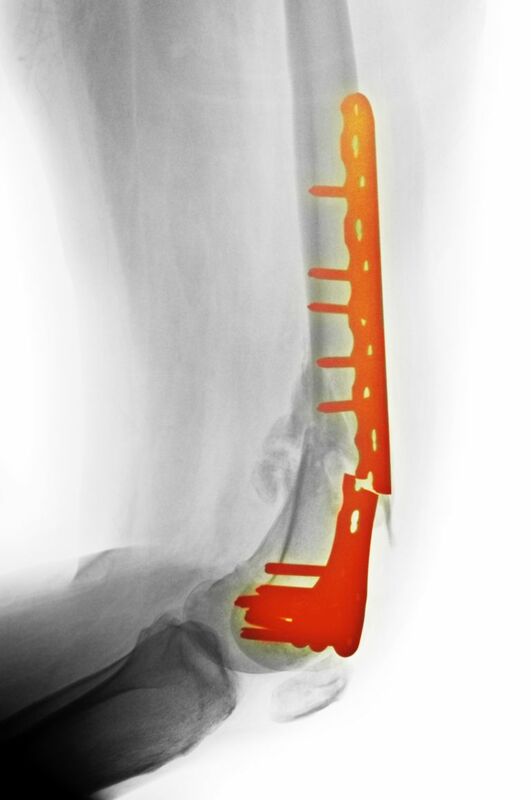 If a bone is broken, a metal implant may be used to support the healing skeleton, but the metal is designed to support the skeleton only until the bone has healed. Unhealed Fractures (Nonunions): There are many reasons why a broken bone may not heal or may heal slowly. If a broken bone being supported by metal does not heal, the support provided by the metal may eventually be insufficient. Loose Implants: Implants that are loose are subjected to higher stresses than solidly fixed implants. This can occur with loose hardware from a fracture repair or a loose joint replacement implant. Insufficient Strength of Repair: The stress of a broken bone requires a minimum amount of support when repaired. Insufficient strength of a repair may lead to failure of the metal supporting the bone. Expected Broken Hardware: There are a few scenarios where broken metal may be expected. For example, sometimes ligament injuries are repaired with metal. Because normal ligaments move, even very subtly, the metal used to hold the ligament in position may eventually break. Syndesmosis repairs in the ankle often lead to screw breakage when they are repaired with a metal screw. Often broken metal implants require additional surgery, but not always. If the problem is still not addressed, such as a broken bone that has not healed, then the metal may need to be removed and a new repair performed. However, if the broken metal is not causing a problem, then it can often be left in the body. There are some rare circumstances where loose or broken metal can move within the body. This is particularly concerning when the metal is located around the chest or abdomen, and usually less worrisome when the metal is located in the extremities. You should discuss with your surgeon if any further surgery is necessary if you have broken metal in your body. Most orthopedic hardware is designed to stay in the body forever. However, there are situations where hardware may need to be removed. In the setting of broken hardware, usually, that is a sign of a problem with the hardware or the bone supporting it. While sometimes broken hardware is expected, typically it is a sign of a problem with healing. In order to adequately address the problem, the cause of the problem must be identified before the broken hardware is removed. Wagoner MR, Creech CL, Nolan CK, Meyr AJ. "Pictorial Review and Basic Principles of Foot and Ankle Hardware Extraction" Foot Ankle Spec. 2015 Aug;8(4):305-13.